Award-winning hard truths about the NBA since 2005. A Substack newsletter by TrueHoop Inc. I have never seen anything like Patrick Beverley. I'm absolutely obsessed. This man is an absolute weirdo. But so incredibly effective. Is annoying a skill set they test for in the NBA? HENRY: He’s a superhero of something. All-In Man? Even before the playoffs began, he was amazing me with that little viral video of his telling Jae Crowder how to guard James Harden. (It didn’t work, by the way.) What mostly struck me was the urgent energy of his movements—mouth, arms, and everything. He was dying to get his point across. There’s a hyperactive person inside me, a kind of alter ego, that I tend to think of as “caffeine, and lots of it.” It’s a part of me that fades in and out. With him, it’s the whole deal. I did once ask an NBA GM why they bothered flying to see draft prospects in person, and the answer had a lot to do with this. They know the guy can shoot, but can he—in warmups—pound the floor with his fists, scream, and fire up the whole gym? Executives basically spend their lives in planes in the hopes of finding players with the emotional tenor of Dennis Rodman, Kevin Garnett, Chris Paul, and Patrick Beverley. And you can see it rubbing off here and there. Teammate Montrezl Harrell, as David wrote about yesterday, has some Beverley in him. I will bet you any amount Dennis Schroeder has studied him. He has done terrible things. Make no mistake. It sure looks like he destroyed Russell Westbrook’s knee, either intentionally or with a total disregard for the norms and safety of others. That disregard is his real superpower, and the reason he’s comfortable putting himself into Kevin Durant’s womb. I’m 100 percent sure that his relentless energy and inability to concede to anything are the reasons the Clippers have now authored three of the season’s biggest comebacks. Most comebacks die because everyone agrees to step off the gas, just a little. If later you have to share a bus and a plane ride with super-caffeinated All-In Man, well it’s probably just less work to fight like crazy for the win. DAVID: Being a pest isn’t a talent. Being a relentless worker, an irrepressible spirit, a great athlete, and tough as nails, is. Can OKC's struggles from the perimeter get any worse? This team hasn't been able to get a sharpshooter to help them with their shooting woes. Sam Presti is one of the best GMs in the league. Why hasn't he gotten the shooters to surround Westbrook and PG-13? HENRY: Games 1 and 2 are small sample-size theater. Basically, 16.5 percent from 3 is about as bad as even this team ever shoots. If I wanted to make the case they aren’t so bad, I’d point out that you’d expect, on average, a team to have two players in the NBA’s top 60, by 3-point percentage, and this season the Thunder had Jerami Grant and Paul George. So, they’re kind of OK. The problem, though, is that by dumb luck Grant forgot how to shoot in the playoffs, George is playing banged up, and beyond that they play a ton of guys who are not ready to spread the floor. (This is the team with the league’s 25th best True Shooting percentage.) That said, my guess is if they change nothing at all, they’ll shoot better. DAVID: It’s hard to imagine them getting worse. They got good-to-great shots throughout Game 2, as should be expected with Steven Adams rolling and Paul George and Russell Westbrook working. Not easy for any team to defend everyone. I don’t know why they’re making less than half of what they averaged (34.8 percent) this season, besides playoff pressure, road games, etc. It’s possible their shooting recovers in Games 3 and 4. The Thunder finished in the bottom eight in 3-point shooting percentage this year, and that’s without career 26 percent 3-point shooter Andre Roberson. The only other playoff teams close to that bad are the Nuggets and Pistons. So clearly it’s an issue to address this summer. It was a concern last summer, too. Honestly, there’s a reason for concern about the futures of coach Billy Donovan and general manager Sam Presti. Not a major concern, as both men would have amazing job offers moments after termination. Is Brett Brown on the hot seat if Philly doesn’t get past Round 2? DAVID: Jeff, in short: yes. How the Sixers play in a loss matters, too. Is it a seven-game masterpiece or a six-game loss where they have some bad luck/injury or their opponent just plays incredibly well. I thought Ben Simmons’ performance last night was HUGE for Brown. Remember, this is not the GM who hired him; Elton Brand just arrived this year. Simmons has to be seen as a player on the rise, because there is one area he simply has made zero progress in. Zero. That he can’t shoot at all, and won’t even try, is an issue that will haunt him, and his coach, until it is rectified. But Simmons has grown overall as a player, for sure. He’s trending towards a Defensive Player of the Year award, or at least lots of votes (there are some giant centers who always will get more attention), and he has greatly improved his game management. Last night, without Embiid, he hit 11 of 13 shots and was the best player on the court by far. If he continues to show he can dominate games, they’ll win more and help Brown retain his job. A comment from Twitter on Derrick White, the latest of many players through the years to defy expectations in a Spurs uniform. Derrick White [is] just another example of if the Spurs ever call offering you a deal, hang up the phone immediately and sign whatever it is they want to trade for to an extension. Point guard, apartment lease, babysitter, it don’t matter—they know. DAVID: The lesson learned by now is that whomever they acquire has a better chance at reaching their potential than with most other franchises. This Derrick White on most teams is a third-string guard. And now Henry grills David. HENRY: How long does LeBron have? DAVID: His numbers this season were almost identical to last year in every way. Other than the injury, he showed little sign of aging. Want to guess what Michael Jordan averaged when he was 39? Twenty points per game, six rebounds, and four assists, with a PER of 19. I contend LeBron can play even longer than that. To me the real question is, how old will he be when he’s on a team that’s not in contention and has little chance of making any postseason noise in the foreseeable future? Older superstars like Dwyane Wade, Michael Jordan and Kobe Bryant tend to retire once they can’t carry a team to contention. If LeBron’s stuck on the Lakers, that could happen in a couple of years. But I would not be shocked to see him on one more team, hoping that team can contend with him as one of several key players. I’ve long believed he and Kevin Durant would play together. If Durant heads to the Knicks and the Lakers keep stinking, I can see LeBron move to the other media capital of the nation. LeBron, Durant and a great guard—-they’d be a strong team for a while. HENRY: Enes Kanter was recently cut by one of the league’s worst teams. Now his Blazer teammate Damian Lillard is calling him the MVP of Game 2. What happened? Did he a) luck into a couple of good games, b) improve, or c) something else? In other words, which version do you expect tonight, next week, next season, and beyond? DAVID: See my answer about Derrick White. Portland has an amazing culture, led by one of the world’s top players and someone I hear is as respected by fellow players as anyone playing today. Kanter is an odd guy. I can think of no better place for him; the city and the team help him so much. I think we’ll see what we’ve been seeing. This is who he is. OKC will likely shoot better, but Kanter will rebound and fight anywhere he plays. HENRY: David, help me understand this: About a quarter of the NBA is foreign-born. But it seems to me like if you’re 6-foot-8 or taller, in the playoffs, and have a lot of skill, you’re almost likely not to be American. Joel Embiid, Giannis Antetokounmpo, Clint Capela, Steve Adams, Nikola Jokic, Nikola Vucevic, Rudy Gobert, Marc Gasol, Al Horford, Serge Ibaka, Enes Kanter, Domantas Sabonis, Pascal Siakam, Ben Simmons, Danilo Gallinari, Andrew Bogut, Bojan Bogdanovic, and that’s without counting Luka Donkic, Jusuf Nurkic, and many others. Am I right? Do you agree that’s a trend? What is driving that? DAVID: I get where you’re going with this. And I think I can call myself an expert on player development, from the youth level to the pros. I don’t think any country produces better super-tall guys than America. But here is where you’re dead right. The pure centers skew heavily foreign. Nurkic, Jokic, Gasol, Vucevic, etc. are special talents. I defend aspects of our AAU culture here, but not on every point. By and large, high school basketball and AAU basketball lack good system coaching. Not enough teams run sets out of the pinch post, for example, like the Warriors do (and many teams who adopt some of Rick Adelman’s beautiful “corners” offense he got from Princeton legend Pete Carrill). The teams I’ve seen do that tend to do extremely well. Our big men are not, often enough, learning how to play the “beautiful game” (a great way to describe top-level soccer), where spacing and timing mesh with skill to create scoring options as the players play “jazz” and not just take turns taking their man one-on-one. College ball isn’t much better, scheme-wise, though players there do develop strength and toughness, not insignificant to their overall development. Of course there are exceptions, as some colleges have done great work with some players. Embiid and Sabonis are two of more than a few examples over the years. Allow me one other thought: America’s big men tend to be very athletic, or rather, they play athletically. Nerlens Noel is one shining example. When you can just run around or jump over defenders, a skill game isn’t required. Some of the centers we’re discussing lack athleticism compared to their American counterparts. So they were forced to learn to excel through their skill/craft game. I contend the American system “loses” many big men with average athleticism because they get outplayed by more athletic opponents. The top colleges prefer the better athletes, so the less athletic bigs go on a different track. They play against inferior competition more often in lesser leagues. That doesn’t help their development. International players are taught how to play basketball, not just how to play center. Over there they are asked to do everything. Over here most coaches still want their big man to dunk and block shots and that’s about it. Kareem likes to say he learned touch and the hook shot because the NCAA outlawed dunking. Well, if you’re a big man who finds it hard to dunk when you’re 16 but you love to play, you learn other skills. Systemically, this is an advantage for the international player. For me, going back to 1988, I’ve always believed in teaching players how to play basketball from every position on the court. Guards should learn to post up and how to defend the post, just as big men should learn to dribble, pass and shoot. If America offered a more uniform curriculum for all players, we’d have more skilled big men than we do, but we’d still be lucky to have more than just a couple additional NBA players. There are only about 280 spots in the NBA for guys 6-foot-8 or taller, and we don’t have any real advantages over the rest of the world at filling them. 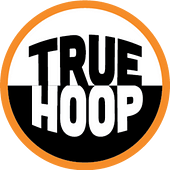 What happens on TrueHoop? If you’re new here, dip your toe into our ongoing series by reading this post about the NBA’s oligarch or that post which kicks off a series about how LeBron sees the world. Next week: another installment in the LeBron series, and more playoffs.